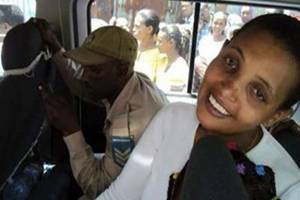 Birtukan Mideksa, prominent Ethiopian political prisoner, was freed today from almost two years of absurd imprisonment---a blatant abuse of power by the EPRDF, specifically PM Meles Zenawi. She was accorded a hero’s welcome by family, relatives, friends and supporters. A press conference is due in few hours where her terms of release will be detailed. The public face of the brutal Federal Police is startling. Clean shaven, tall, a little on the bulky side, urbane, and tastefully attired, he is in fact the opposite of the popular caricature of the uncouth and uneducated Federal Police officials. 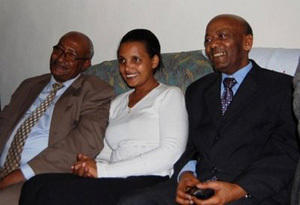 Werkeneh Gebeyehu , Commissioner of the Federal Police and its public face, though real power lie with his deputies, cut an impressive figure behind his desk as he spoke with Birtukan Mideksa on December 10 2008. “What legal mandate does the Federal Police have in regard to this issue?” inquired Birtukan Mideksa, President of UDJ, an opposition party, after the Commissioner had winded down. He smiled contemptuously before he answered. But her courage surprised him. This is probably the first time for him to personally experience it. “This is no academic discourse,” he said, trying his best to deepen his voice. He was really caught off guard. 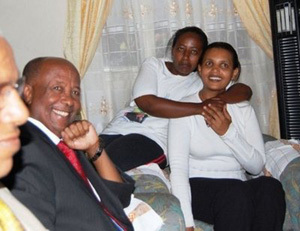 This could hardly been discussed when he was instructed to speak with her by the battle-hardened leaders of the EPRDF. “I think its best if you avoid raising such kind of questions,” he said, almost unconsciously with who-cares-what-the- law-says tenor to his voice. Werkenh recapped by insisting that the terms of Birtukan’s conditional pardon had been violated in Sweden; where, he alleged, she had publicly denied seeking pardon to get out of prison. He sought a public retraction. Birtukan parted with the Commissioner convinced that the EPRDF was out to frustrate her party’s prospects from the very outset. Almost two weeks later, Birtukan was again summoned by Werkeneh, this time courtesy of a warrant, which she demanded, to his lavish office in downtown Addis. It was to be a brief sojourn. “You have three days to deliver a public retraction of your statement in Sweden to this office. If not, the government will assume that the pardon was secured under false pretense and revoke it,” he told her officiously. There was nothing more either side could say. An ultimatum had been delivered and a time-frame set. Upping the challenge, the demand was publicized on state media that night. The nation held its breath in suspense. Asked abourt Birtukan’s imprisonment, Meles Zenawi, was adamant that she will not be freed. “ It will undermine the process,” he said repeatedly. She had her one chance. Of course no one believed him; not even his steady admirers. Posing defiantly before probing journalists after a universally mocked “election victory” , Meles Zenawi,PM, whose party “won” 99.6% of parliamentary seats, spoke about her harshly, but noticeably absent the typical ardor: “This(her release) is a purely legal issue, and it is between her and the law. No one can come between the two. No one. Not opposition parties, not our friends abroad." Meles responds to query about Birtukan's imprisonment at Columbia University. " I wouldn't be surprised if she were to ask for a pardon. And I wouldn't be surprised if the government was to grant it to her," he said. Few days later, "mediators" leaked news of her imminent release. Family members also quietly confirm her pending release. Mediators inform journalists of a planned press conference on October 5 2010. The theme: Bitrtuka's release. It's now semi-official. Less than twenty four hours to go! Birtukan is finally FREE! Accorded a hero's welcome.